The Cisco Catalyst 6880-X Series Switch, part of the Cisco Catalyst 6800 product family, is a highly scalable and manageable solution for user access offering up to 1008 (FCS) 10/100/1000 ports within a single management system when working with the Catalyst 6800ia remote linecard, while providing the same feature set as a regular Catalyst 6500 that you might be longing for. Based on the proven and stable Cisco Catalyst 6500 Series Supervisor Engine 2T architecture, this unique platform delivers unprecedented capabilities on day one that include best-in-class scalability, flexible 10G port density, a complete suite of L2/L3 virtualization, Virtual Switching System (VSS), Cisco Instant Access1, Application Visibility and Control (AVC), Security (Cisco TrustSec), multicast, IPv6, and rich media services (Medianet). With full MPLS/VPLS functionality and large table sizes (up to 2M IPv4 routes), this platform also offers a cost-optimal solution for Internet edge/peering deployments as well as emerging leaf-spine models. 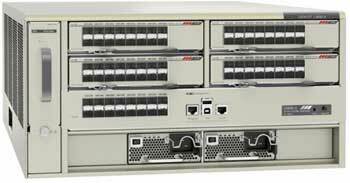 Note: Cisco Instant Access on Cisco Catalyst 6880-X will be supported in Q1CY2014. Port cards will be supported in Q1CY2014. The Cisco Catalyst 6880-X and Port cards. •Platform Scalability: Pay as you grow model to meet and expand the growing enterprise 10G port density requirements in radically improved economics. •Application Visibility and Control (AVC): Support for advanced applications such as Flexible Netflow for deeper visibility into the applications to optimize network resource usage, plan network capacity, and enhance security monitoring at application level. The platform also offers several rich media features, including Medianet, to ease video deployments in the enterprise and offer a rich user viewing experience for IPTV, Telepresence, and video surveillance. •Security: Support for Cisco TrustSec (CTS), to provide IEEE 802.1AE MACsec encryption and role-based ACL, CoPP to prevent DoS attacks and Cisco ISE to safeguard and manage end-to-end security for the enterprise. •Virtualization: Comprehensive suite of Virtualization features including L2/L3 VPN, full MPLS, EVN, VRF aware applications for NAT Netflow, GRE for v4/v6, L2 extensions with VPLS etc. to segment different user groups and serve unique security/QoS policy requirements of each of these diverse user groups. •High Availability: By connecting two of the switches in VSS mode, the platform supports nonstop communication with stateful interchassis failover and subsecond virtual switch recovery. VSS mode eliminates the need for a First Hop Redundancy Protocol (FHRP) such as HSRP or VRRP in a simplified loop-free topology. •VSS, a widely deployed solution for smart management with a single IP address and configuration, with support for Multichassis EtherChannel (MEC). •Smart Install Director for zero-touch installation, upgrade, and replacement. This solution provides significant ease of use to automate software image management, configuration, and upgrade of directly connected switches. In addition, this solution simplifies provisioning of new switches with network expansion and faster replacement of switches for quick failure recovery. •Cisco Instant Access, an innovative technology to simplify, manage, and troubleshoot with a single point of management. This technology allows users to manage an entire distribution pod of connected access switches in one domain therby eliminating repetitive configuration of VLANs and portchannels across the pod. This solution not only extends several backbone features to the access layer that would otherwise not be available on the access but it also preserves the widely deployed access features such as PoE+ and stacking. •Enhanced Fast Software Upgrade(EFSU) in an interchassis VSS configuration. •Cisco Prime support, an integrated device management solution. Note: SFP+ ports capable of supporting 1G SFPs and 10G SFP+s. Using the Cisco GLC-T SFP (1G Copper SFP) 1G/1000 Mbps Copper is also supported. 4 With a reverse breakout cable (future support) combining four 10G ports to act as a 40G port.